It’s been a foggy day here. Reminiscent of many other foggy days. One in particular, where I had a flight to Halifax. We took off in fog and flew almost all the way to Halifax but couldn’t land. We turned around and flew back to St. John’s and were able to land. I remember the discombobulation of the situation and asking myself, “Did I actually just go anywhere?” The days following that “non-flight” were unique as well because my YYT life was completely open and cleared because of the trip to Halifax…so I had two totally unscheduled days at home because of my flight to nowhere. I haven’t been writing much lately. There hasn’t been much down time so far this fall between travels, presentations, and outreach to schools. I’ve wanted to write. Longed to write. But also didn’t. Because writing would demand that I sit still, slow down, and let the fog that has been swirling around me since May blow away. I was startled yesterday to do the math and see that almost six months has passed since I returned from Everest 3.0. It’s been a rich and full time… full of recovery, disappointment, and short travels here and there. I’m not the best at in and out travel. Better at all in. Or better at all out. Transitioning so much between in and out has me a bit tired so I’m glad to have carved out an evening to sit and write. 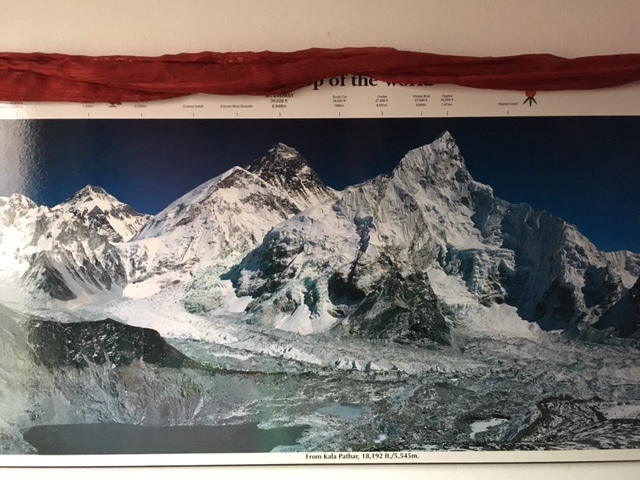 To catch the words that drifted by this morning as I stared at the Everest poster in our entry way before heading out into the shaggy fog that enveloped the city like newly shorn wool. Staring at the poster, I wondered what I’d accomplished with Everest 3.0. Since I’d reached a similar height as I did on Everest 2.0, had I, like the ill-fated Halifax flight above, really gone anywhere? Had this expedition made a difference to me or to others? What did I learn from the experience? What do I want to take from it into future expeditions? In that glance at the poster, I saw the fog I’d been living in, with, and through since returning because I hadn’t stopped to ponder the deeper answers to the above questions. The two most common questions I’m asked…often several times each day…often by complete strangers (and by dear friends as well) are 1) What are you climbing next? and 2) Will you try Everest again? My current answer to both questions is “I don’t know.” For the first time in a long time, I don’t have a plant ticket to anywhere. I have some ideas floating around. It likely won’t be too much longer before a next trip crystalizes in my “snow globe” and a ticket purchased. But for now, I don’t know. The most sustaining emotion I have about Everest 3.0 is disappointment. Not disappointment about not reaching the top (is that a double negative?) but disappointment about how the expedition ended. The ending was so unexpected. So sudden. With so little closure with the mountain and my teammates. 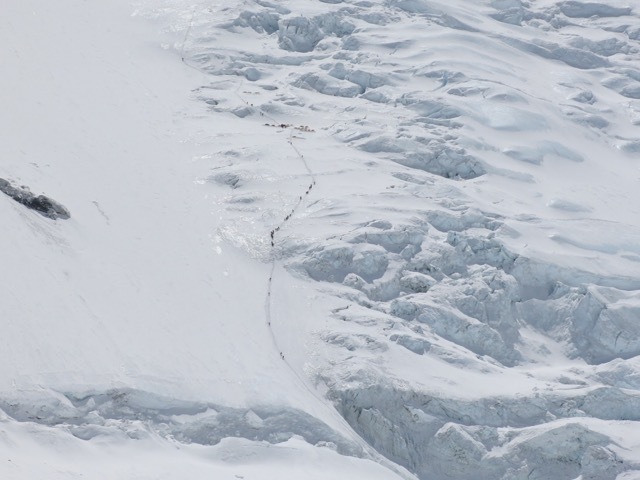 When I made the decision to ask for flight assistance over the Khumbu Icefall, (not wanting to expose my teammates to extra risk by spending extra time with me in one of the most dangerous parts of the mountain,) I hadn’t fully comprehended the end game and how subsequent decisions would spiral out of my control. I wrote a piece about the helicopter flight out for the inaugural issue of Panorama: The Journal of Intelligent Travel. You can read it by clicking the link. In that piece, I explore my two-mindnessness during that flight–both so not wanting to be having the experience and so enjoying the view. The flight propelled me from the mountain heights to the valley lows. I was so suddenly displaced with no clothes, shoes, money or identification that it took a few days to work all of that out all the while suffering from a middle ear disturbance from the flight. It was total and utter discombobulation on all levels. Hope to return to trek with my friends came and went. Hope to return to the mountain came and went. Want to return home came and was granted by the sudden availability of a flight home. Camp Three to home in less than a week. 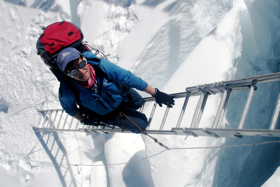 What I really wanted and hoped for in Everest 3.0 was a true shot at the summit. The summit would have been gravy. The maraschino cheery on the top of the Everest sundae. 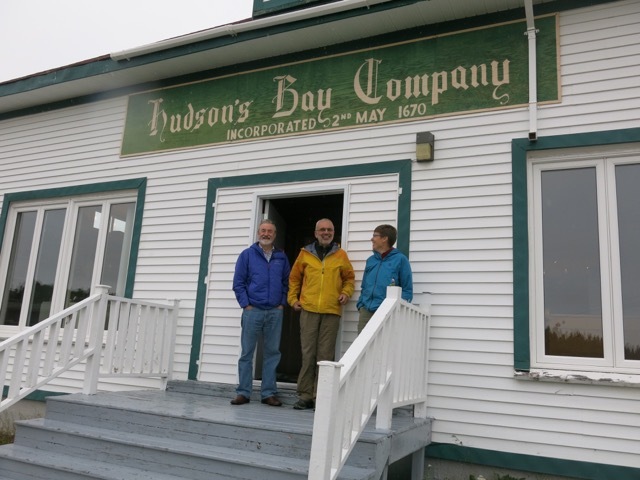 Instead, I left St. John’s with a nagging cough that likely caught up to me during the expedition through either walking pneumonia or HAPE depending on whose analysis of it all you want to go with. So…no true shot for me this go-round, no ground gained over previous attempts, no closure granted, just a gapping crevasse of disappointment. 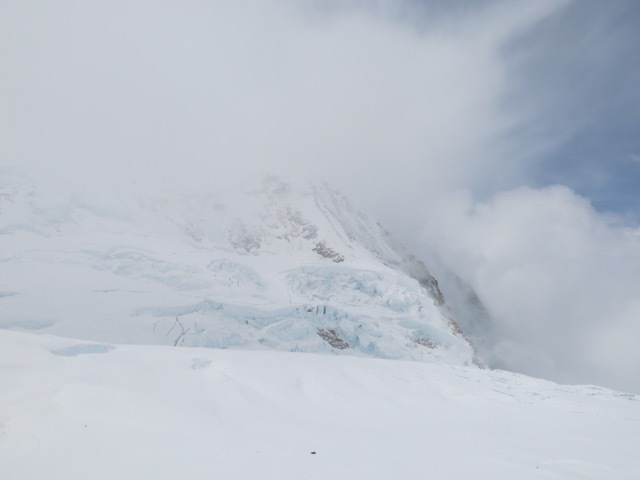 I’ve needed to find a snow bridge to use to cross over-or perhaps an Icefall Doctor’s ladder would do the trick…So as the fog began to drop this morning, I could dare to see…if my core wants/needs/aims/goals/vision for the expedition weren’t met by this attempt, what was? What was accomplished? If I cross over the far side of the crevasse, with knees weak and weary from the effort, with safety ropes tightly grasped in my hands, with tentative steps taken over the rickety ladder, I can see that I did go some place, that many things were accomplished, and that once again, disappointment is and will be my teacher. The other side of the foggy ladder reveals a celebration in deciding to go back. In deciding to risk “failure” again. In knowing that I might not get higher. That I might get/be lower or slower or older. That I faced fears both internal and external to go back. Knowing that it was harder to go back for Everest 2.0 that Everest 1.0. 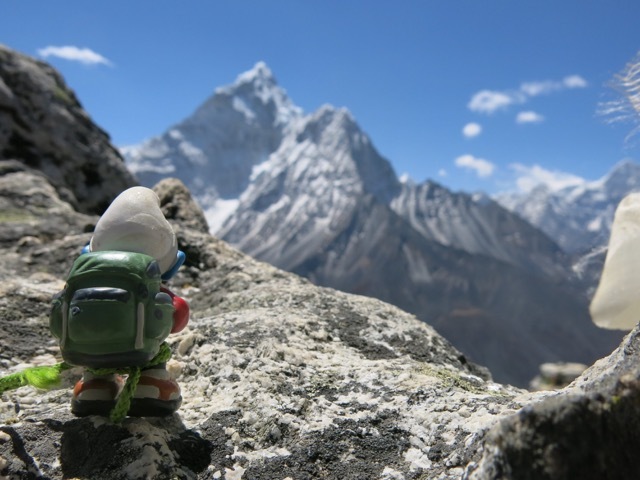 Harder still to decide to go back for Everest 3.0 knowing how tough and exacting and demanding the path to and up Everest is… that I would decide to stretch again for a third time. That is a victory. A win. A thing to be celebrated and shouted off hill tops. I’m proud that I trained hard, prepared well, and went ready for the challenge. I’m proud of my HKR students who prepared an excellent school engagement program. I’m proud of having visited many schools before and after the expedition. That many schools were active participants in the expedition. That I had a tweet-fest with one of my co-chairs in learning and teaching. That I showed kids that it’s OK to try and that sometimes we don’t get to climb as high as we want to. 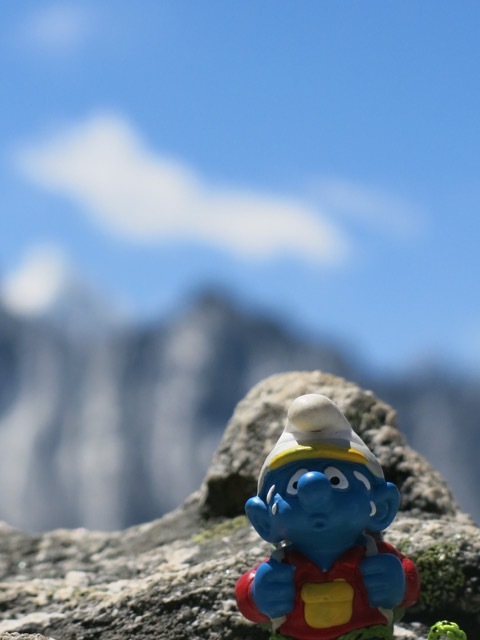 That Climber Smurf is an awesome climbing partner. That my expeditions/explorations/adventures are like a crossword puzzle-it’s important to have UP, DOWN, and ACROSS. That there is a time and a season for everything. Including rest and regrouping. That I dug deep, bringing forth footsteps from the deepest part of myself. That I respected my limits, real or imagined or enforced. That I respected my teammates and Nepali climbing staff. That I shared much of the expedition in real time with creativity and joy. 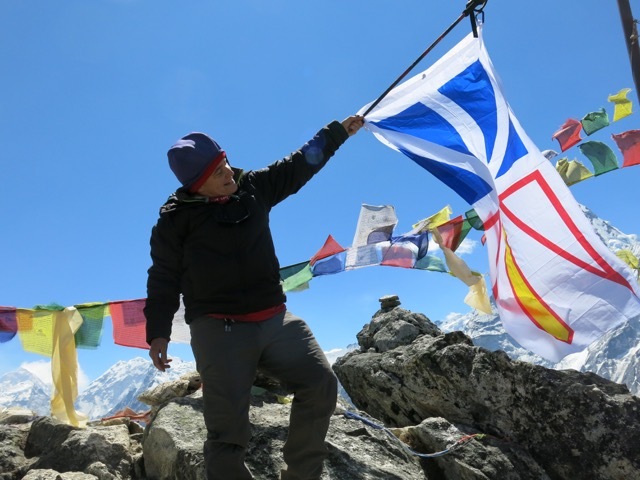 That I continue(d) to be in the public eye as a public dreamer and that I’m willing to answer most any question about climbing Everest in most any setting whenever asked. For all of the above and more, I am proud and I know in the ultimate equation makes living with/though the disappointment worth it. What did I learn for next time? These are a few of the things I’m putting into my backpack for future expeditions…it’s wonderful to climb with teammates I know, that there is a delicate balance between adequate acclimatization and wearing yourself out at altitude-that you must do enough of the first with as little of the second…the first being priority. That managing mind and emotions are important along with managing body (Can you really separate them?). That it’s always easier to take pictures on sunny, good weather days but the story might be in the storms. That I like the word that. 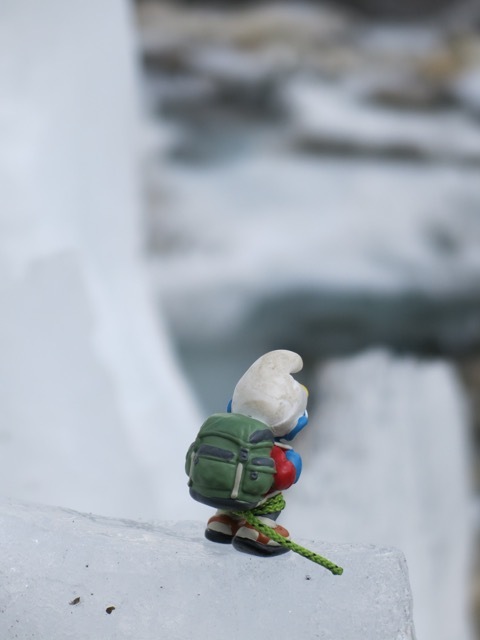 That the world of blue, white and ice is worth taking such hard steps to see and experience. That there is a balance between training and life. Finding the minimum effective dose is a good aim but also make sure you use all the tools in your toolkit. Train all intelligences (i.e. mind, body, spirit, kinesthetic, creative, etc.). Share all of the above. That I’m OK always. No matter what is happening or what I am doing or not doing. That the biggest mountain is within as are the deepest valleys. And that we must come down from the summit again and again. Keep it fun. Keep it real. Keep it real fun. Work hard. Enjoy the work. Temper the work with fun and community. Don’t lose sight of the true summit. Like an airplane exit, it might be behind you. And always, enjoy the view because it is pure magic to see alpine glow dancing across the crisp flanks of stoic mountain…and seeing the mountain blush. 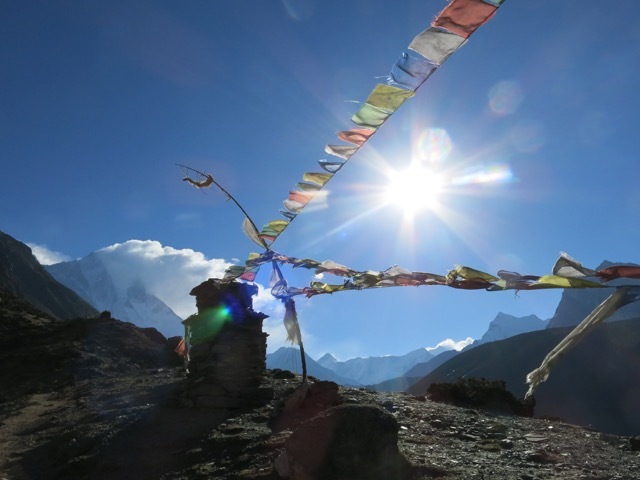 This entry was posted in Everest 3.0, Life and tagged 2016, climb, Seven Summits, train. Bookmark the permalink. I finally had a chance to read the whole thing. Beautiful honesty, words, ideas, and feelings. You are an inspiration whether you reach the ‘top’ or not. Attempting is the top for me, you have done that in spades! The mind is willing but the body is the boss. 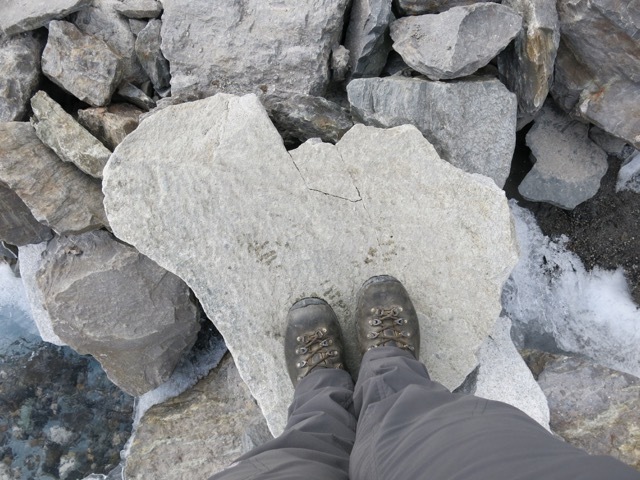 Your thoughtfulness towards your fellow climbers and your own body is the bravest venture of all. Very nice read as I’m currently at EBC, struggling with a lung infection and trying to decide what is next for me.